Our neighbor's grape vines are loaded right now and even though I'd love to wash my hands of food preservation at this point, I can't ignore free fruit. I'm incapable. For some of us, concord grapes can prove to be...well...itchy. Just pulling them off the stems is fine, but when I start separating the pulp and skins, my hands start reacting. I can usually make it through my task, but by the end of it, I'm about crawling out of my skin. Washing my hands and lower arms doesn't provide relief, so I sit and itch my hands for a solid 15 minutes until the worst of it passes. I learned about this reaction the hard way the first fall we lived here when Sam reacted to the grapes while helping me. I felt so bad for the boy. He seemed to grow out of it (and Sadie never reacted this way) which was great, but poor Miriam...she had peeled (by hand) and eaten about 20 of them before her little mouth, chin and hands started itching like crazy. I plumb forgot what it can do to my little people. Itching for her, lots of empathy and some cortisone cream ensued and about a half hour later it abated and she was fine. And has steered clear of the grapes since. So, go out and get yourself some grapes, but consider yourself warned (Note: None of us react to them once they're cooked). The other week I made grape jam and this past week, I readied grape pie filling. This past weekend, Jamey made juice. 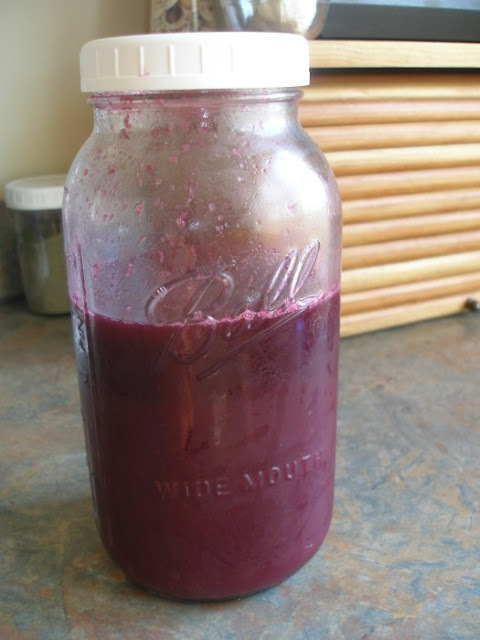 I know of two juice-making methods that do not require a fancy juicer. 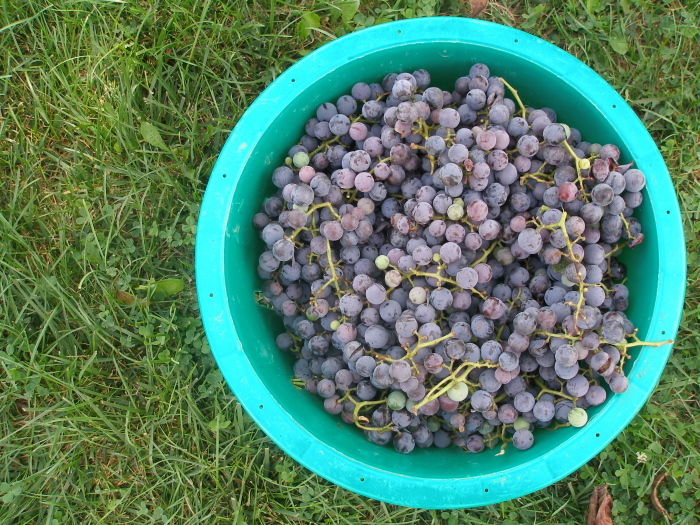 The first requires no special equipment and involves placing whole grapes, water and sugar into canning jars and processing them (recipe and instructions here). The other method, which we used this past weekend, is fast becoming our favorite. There is no sugar involved- only pure grape-y goodness. This time, we just froze a handful of quarts of the concentrate, drinking a good portion of it fresh shortly after making it, but it can be canned (see below) and we'll do that next time. Place all grapes in a pot suited to hold the amount you have. Bring them to a boil (don't add water- they make plenty of juice) while mashing them up a bit using a potato masher. Simmer for 20 minutes until the grapes are very soft. Transfer the cooked grapes in batches to a food mill . Here you have two choices. Turning the food mill the normal direction will give you a very thick grape juice that would compare to extra-pulp orange juice. It can be diluted, but you will still have some "pulp-y" texture to your juice. If you don't mind this, by all means, make the juice this way. You'll use more of the grapes and end up with more juice. Your second choice (the one we choose) is to run the food mill the opposite direction (as if you're trying to skim out the mill). This scrapes the grapes through, giving you mostly juice with a little bit of "pulp". Chill the juice (what comes through the mill) and drink or freeze. You can add water to thin it if you like or use it in it's potent form. It's delicious. LOOKS DELICIOUS BUT i HAVE NEVER HEARD OF GRAPE PIE FILLING-DO YOU MEAN THAT LITERALLY? Those grapes look sooo good. :) Too bad about the itch issues though. This is making me thirsty. Mmmm. I am glad I am not the only one that can't turn away from ripe fruit. It IS a disease I tell you. Grape pie filling- that sounds so interesting! I have never made grape juice myself, but you made it sound so simple. Thank you. So have you made a God's blood pie? Once we had famous guests coming for dinner and I thought I'd impress them with my smashing rendition. What a disappointment to learn they were already familiar with it. Grape Pie is wonderful. Follow the link above to read more about it. I've never heard of God's blood pie. Enlighten me, please? You can can this grape juice! I added a note above:-). That juice looks absolutely beautiful! Jane, it's the kind of pie Anna Schlonneger bakes for the Farbers' Christmas get-together. P.S. I'd never think of robbing you of your pickled beets. Especially if your jarfuls have any air pockets. I'm curious to try the pulpy juice method. I did the grapes/sugar/hot water in jars and we thought it tasted too kool-aidy. "...Remove canner lid and boil an additional 5 minutes..."
What does removing the lid do for you? Several canning books suggest this step. I'm not sure of the exact science behind it but I like this step because it allows time for steam to escape (which keeps me from being too eager and exposing my hands to the steam), and often the lids seal during this time.